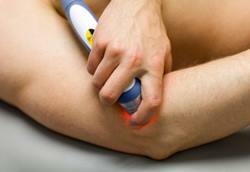 Cold Laser Therapy works through photo absorption. Laser Light energy converts into chemical energy, which initiates a cascade of events at a cellular level. HOW DOES THE LASER WORK? There have been numerous scientific studies & there are many research articles that discuss different aspects of Low Level Laser Therapy. Laser therapy works through photo absorption. Laser light energy converts into chemical energy, which initiates a cascade of events at a cellular level. * Laser therapy promotes healing in many conditions, because it penetrates the skin, increases ATP (energy) and activates enzymes in the targeted cells. * Growth factor response within the cells and tissue as a result of increased ATP and protein synthesis (building up). *Pain relief as a result of increased endorphin release. * Strengthening of the immune system response via increasing levels of lymphocyte (white blood cell) activity.